Seyfi Abad Shapouri, M., Ekhtelat, M., Ghorbanpoor Najaf Abadi, M., Lotfi, M., Rashno, M. (2016). Production of monoclonal antibody against recombinant NS3 protein of bovine viral diarrhea virus (NADL strain). Veterinary Research Forum, 7(3), 247-253. Masood Reza Seyfi Abad Shapouri; Maryam Ekhtelat; Masood Ghorbanpoor Najaf Abadi; Mohsen Lotfi; Mohamad Rashno. "Production of monoclonal antibody against recombinant NS3 protein of bovine viral diarrhea virus (NADL strain)". Veterinary Research Forum, 7, 3, 2016, 247-253. Seyfi Abad Shapouri, M., Ekhtelat, M., Ghorbanpoor Najaf Abadi, M., Lotfi, M., Rashno, M. (2016). 'Production of monoclonal antibody against recombinant NS3 protein of bovine viral diarrhea virus (NADL strain)', Veterinary Research Forum, 7(3), pp. 247-253. Seyfi Abad Shapouri, M., Ekhtelat, M., Ghorbanpoor Najaf Abadi, M., Lotfi, M., Rashno, M. Production of monoclonal antibody against recombinant NS3 protein of bovine viral diarrhea virus (NADL strain). 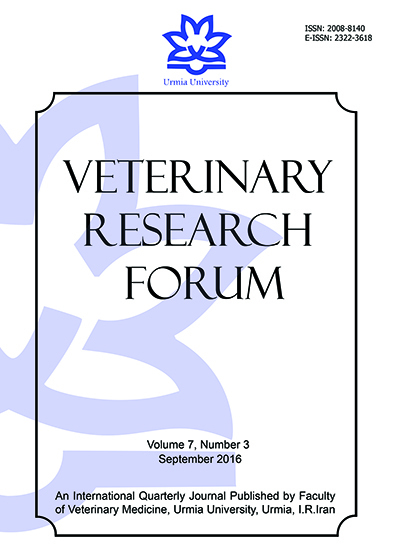 Veterinary Research Forum, 2016; 7(3): 247-253. Bovine Viral Diarrhea virus (BVDV) is an important viral pathogen of cattle causing several clinical syndromes. There are usually no pathognomonic clinical signs of BVDV infection. Diagnostic investigations therefore rely on serological detection and virus isolation. Nonstructural protein 3 (NS3) as immunogenic protein of BVDV is genetically and antigenically conserved among different isolates. This protein is therefore a candidate antigen for developing ELISA for serological studies. The aim of this study was to produce monoclonal antibody (MAb) against recombinant NS3 protein. For this purpose, the recombinant MBP-NS3 protein was expressed into expression vector pMalc2x in E. coli and purified using amylose resin chromatography column and the purified protein used as antigen in MAb production. After immunizing Balb/c mice with the recombinant antigen, the mouse showing highest titer of anti-NS3 antibody by indirect ELISA was selected for fusion. Spleen cells of the immunized mouse were fused with SP2/0 myeloma cells using polyethylene glycol. The cells in fusion mix were re-suspended in HAT medium and distributed in 96-well plates. Then culture supernatants of primary clones were screened by indirect ELISA. The positive clones after three times cloning, were selected and the reactivity of the monoclonal antibodies with recombinant and natural antigens was established by Western blotting. Based on these results, it appears that the specific monoclonal antibodies produced against NS3 recombinant antigen may be suitable for developing BVDV laboratory diagnostic assays. Bovine Viral Diarrhea (BVD) is an economically important disease of cattle with a worldwide distribution. The BVD is caused by bovine viral diarrhea virus (BVDV) which belongs to Pestivirus genus within the family of Flaviviridae.1 The BVDV is capable of producing a broad range of clinical signs, ranging from most often asymptomatic infection to severe acute disease with signs from the enteric, reproductive or respiratory organs. Bovine fetus infected with non-cytopathic biotype of BVDV between days 30 and 125 of gestation can develop immune tolerance against the virus and will be born persistently infected (PI) shedding the virus continuously.2 Diagnosis of BVD relies on laboratory-based detection of its viral causing agent (particularly for the identification of PI animals) or virus specific antibodies. The most common laboratory method for this purpose is enzyme-linked immunosorbent assay (ELISA).3 The most immunogenic proteins of BVDV,4 including Erns and E2 structural proteins and the non-structural NS3 protein have been prepared as recombinant proteins and applied to design ELISAs for the detection of specific antibodies in cattle sera.5 The NS3 is an 80 kDa (p80) protein which contains an N-terminal serine protease domain and a C-terminal RNA helicase.6 Production of NS3 is essential for the viral RNA replication and cytopathogenicity.7 This protein is also highly conserved among pestiviruses and induces a strong humoral immune response in cattle exposed to live BVDV either naturally or by vaccination.8 Therefore, it is a proper candidate antigen to detect antibodies against the virus in the sera of infected animals. For this purpose, NS3 and NS3-specific monoclonal antibodies (MAbs) were used to design ELISAs (indirect and competitive ELISA) for the detection of specific antibodies against the virus.5, 9-11 During the recent years, economic impact of BVDV infections has led a number of countries in Europe to start eradication or control programmes.12,13 In Iran, the prevalence of BVDV antibodies in adult cattle is around 25.0%.14,15 It is therefore desirable to have a rapid, sensitive and reliable means of identifying infected animals for control and eradication of BVD. Anti-NS3 MAbs were produced mainly following immunization with whole virus. The main objective of this study was to produce monoclonal antibody against recombinant NS3 antigen of BVDV that was produced in an efficient bacterial expression system to design a local competitive ELISA for detecting infected animals in future. Materials. SP2/0 murine myeloma cell line and Balb/c mice were obtained from Razi Vaccine and Serum Research Institute, Karaj, Iran. Hypoxanthine aminopterin thymidine (HAT), hypoxanthine thymidine (HT), RPMI 1640 medium and fetal bovine serum (FBS) were purchased from Gibco Laboratories (Grand Island, USA). Anti-mouse IgG proxidase and polyethylene glycol (PEG) were obtained from Sigma (St. Louis, USA). All chemicals were of analytical reagent grade quality. Expression and purification of MBP-NS3 fusion protein. Production of recombinant MBP-NS3 protein in pMalc2x expression vector, under the control of the lac promoter in E. coli BL-21 strain had been previously produced in our laboratory.16 For expression of MBP-NS3 protein, a bacterial colony which had no mutation in the NS3 insert was selected and cultured in high volume of ampicillin embedded Luria-Bertani (LB) broth media (Merck, Darmstadt, Germany) containing 20 mM glucose, until the OD 600 reached to 0.5. Then, protein expression was induced by adding isopropyl-β-D-thio-galactoside (IPTG) (Cinnagen, Tehran, Iran) at a final concentration of 1 mM. After 4 hr incubation at 37 ˚C, expression of the recombinant MBP-NS3 protein was examined by SDS-polyacrylamide gel electro-phoresis (SDS-PAGE). To further analyze, expressed protein(s) were analyzed by Western blotting, using a BVDV antibody positive bovine serum (data not shown). After expression, the bacterial pellet resuspended in column buffer and sonicated to release the bacterial proteins. Purification of the expressed protein (MBP-NS3) from the supernatant of the sonicated bacteria was carried out on a column of maltose-affinity chromatography based amylose resin.17 In order to this matter in the first step, the purification performed based on MBP’s affinity to amylase. Then in the second step, the MBP-NS3 protein was detached from amylose resin by using 10 mM maltose solution as a competitor with amylase. 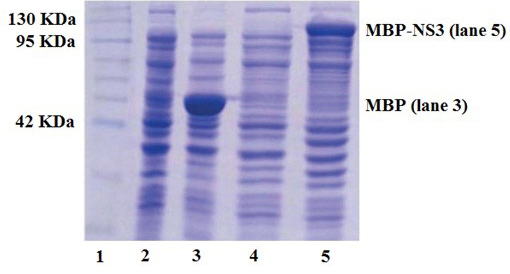 Recombinant protein (MBP-NS3) in collected samples was examined by SDS-PAGE. Maltose binding pro­tein (MBP) is a fusion partner of about 42 kDa (without express alpha fragment of beta galactosidase) encoded by pMAL-c2X plasmid vector at the N-terminus part of the recombinant proteins. MBP molecule plus alpha fragment of beta galactosidase with an approximate weight of 50 kDa is in bacteria containing only pMAL-c2X. Several studies have shown that MBP is a soluble protein and can even solubilize fused recom­binant protein.18,19 As solubility of the recombinant protein was enhanced by MBP at the beginning part of the recombinant molecule, the purification processes were done without any need to treatment with chemical substances like urea. Reactivity of MAbs to recombinant and natural antigen. The stability of antibody secretion in the positive clones after three times cloning was monitored by ELISA and the reactivity of the anti-NS3 MAbs to recombinant and natural NS3 was evaluated by Western blotting. Expression and purification of MBP-NS3 fusion protein. Expression of recombinant MBP-NS3 protein in pMalc2x expression vector in E. coli BL-21 strain was induced by adding IPTG to a bacterial culture prepared as the instruction of pMalc2x expression system. Protein profiles of induced and non-induced bacteria by SDS-PAGE revealed that a polypeptide of about 117 kDa was expressed in the induced bacteria (Fig. 1). Considering molecular weights of 42 and 75 kDa for MBP and NS3 respectively, MBP-NS3 fusion protein was estimated to have an approximate molecular weight of 117 kDa. 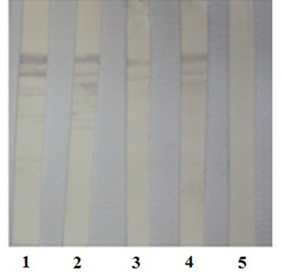 As shown in Figure 2, after purification of the expressed protein (MBP-NS3) on a column of amylose resin and analysis by SDS-PAGE, expression of the recombinant MBP-NS3 is clearly detectable. Hybridoma production and isolation. After immunizing mice with the recombinant MBP-NS3, anti-NS3 antibody in serum of mice was determined by indirect ELISA on day 45. The OD values of immunized sera (1:2000 diluted) were from 1.40 to 1.49 compared with OD values of 0.09 in non-immunized serum (negative control). Spleen cells of the immunized mouse with highest titer of anti-NS3 antibody were fused with SP2/0 myeloma cells using PEG. Hybrids were selected by their ability to grow in HAT medium. Then, culture supernatants of primary clones were screened by MBP-NS3 ELISA and MBP ELISA. Those positive hybrids in MBP-NS3 ELISA which did not react in MBP ELISA were considered as positive. On the basis of primary screening, anti-NS3 antibody in the supernatant of 20 clones was identified with OD value from 0.20 to 1.10 (average 0.52). 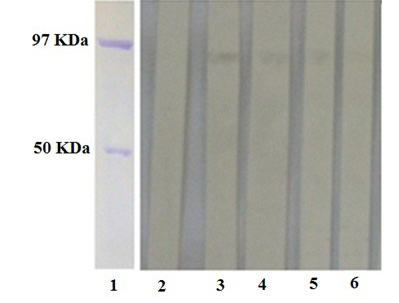 The positive clones with highest titer of anti-NS3 antibody were cloned and screened by indirect ELISA for three times. The OD values of ELISA were higher from 1.10 to 2.70 in second and third cloning with not reacting to MBP. However, anti-NS3 antibody production was stopped in three clones during cloning probably due somatic mutations or deletions of chromosome. Fig. 1. SDS-PAGE analysis of bacteria expressing MBP-NS3 fusion protein before (lane 4) and after (lane 5) induction by IPTG. The expression of a protein of about 117 kDa, corre­sponding to MBP-NS3 is shown in the lane 5. Lane 2 and 3 indicate a bacterium expressing MBP before and after induction by IPTG, respectively. The molecular weight marker is shown in Lane 1. Fig. 2. SDS-PAGE analysis of purified MBP-NS3 fusion protein by amylose-resin column. Lane 1 shows purified nucleo-protein of influenza virus (~97 KDa) and purified MBP (~50 KDa) from control colony containing only pMAL-c2X as protein weight marker. Lane 2 and 3 indicate purified preparation of MBP-NS3 fusion protein (~117 KDa). Reactivity of MAbs to recombinant and natural antigen. 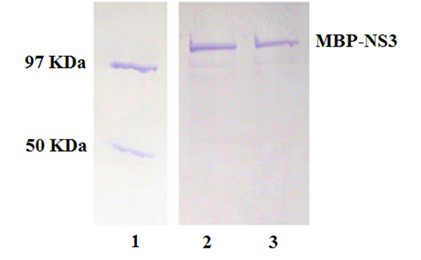 The positive clones after three times cloning were selected and the reactivity of the MAbs with recombinant NS3 antigen was screened and established by Western blotting (Fig. 3). Fig. 3. Reactivity of supernatants of subclones producing anti-NS3 MAbs to recombinant NS3 antigen by Western blotting. Lanes 1 and 5 belong to immunized and non-immunized mice sera as negative and positive controls, respectively. Lanes 2, 3 and 4 represent supernatant of subclones containing anti-NS3 MAbs. Also the specificity and reactivity of the MAbs with the natural form of the NS3 antigen, as shown in Figure 4, were examined and confirmed with BVD virus infected cells as the source of the virus in Western blotting. In the Western Blot analysis, anti-NS3 MAbs reacted with a protein of BVDV that was lower than the 97 kDa marker, that were compatible with the approximate weight of natural NS3 (80 kDa) of BVDV. Fig. 4. Reactivity of supernatants of subclones producing anti-NS3 MAbs to natural NS3 antigen by Western blotting. Lanes 1 shows purified nucleoprotein of influenza virus (~97 KDa) and purified MBP (~50 KDa) as protein weight marker. Lanes 2 indicates supernatant of an unrelated hybridoma. Lanes 3-6 represent supernatant of subclones containing anti-NS3 MAbs. To summarize, in the present study, for the first time, large amount of immunologically active recombinant NS3 protein in an expression system under the control of the strong promoter (lac) of vector pMalc2x were used to produce anti-NS3 MAbs by cell fusion assay. Anti-NS3 MAbs were screened by indirect ELISA and the reactivity of the MAbs with recombinant and natural antigen was established by Western blotting. Based on our results, it appeared that NS3 recombinant antigen and the specific monoclonal antibodies produced against it might be suitable for developing BVDV laboratory diagnostic assays especially competitive inhibition ELISA. This study was financially supported by Shahid Chamran University of Ahvaz, Iran. We also acknowledge the support of Razi Vaccine and Serum Research Institute, Karaj; and Ahvaz Jundishapur University of Medical Sciences. Presi P, Heim D. BVD eradication in Switzerland-A new approach. Vet Microbiol 2010; 142(1-2):137-142. Hilbe M, Stalder H, Peterhans E, et al. Comparison of five diagnostic methods for detecting bovine viral diarrhea virus infection in calves. J Vet Diagn Invest 2007; 19(1):28-34. Sandvik T. Laboratory diagnostic investigations for bovine viral diarrhoea virus infections in cattle. Vet Microbiol 1999; 64(2-3):123-134. Bolin SR. Immunogens of bovine viral diarrhea virus. Vet microbiol 1993;37(3-4):263-271. Chimeno Zoth S, Taboga O. Multiple recombinant ELISA for the detection of bovine viral diarrhoea virus antibodies in cattle sera. J Virol Methods 2006; 138(1-2):99-108. Wiskerchen M, Collett MS. Pestivirus gene expression: Protein p80 of bovine viral diarrhea virus is a proteinase involved in polyprotein processing. Virology 1991; 184(1):341-350. Agapov EV, Murray CL, Frolov I, et al. Uncleaved NS2-3 is required for production of infectious bovine viral diarrhea virus. J Virol 2004; 78(5):2414-2425. Bolin S, Ridpath J. Specificity of neutralizing and precipitating antibodies induced in healthy calves by monovalent modified-live bovine viral diarrhea virus vaccines. Am J Vet Res 1989; 50(6):817-821. Lecomte C, Pin J, De Moerlooze L, et al. ELISA detection of bovine viral diarrhoea virus specific antibodies using recombinant antigen and monoclonal antibodies. Vet Microbiol 1990; 23(1-4):193-201. Reddy J, Kwang J, Okwumabua O, et al. Application of recombinant bovine viral diarrhea virus proteins in the diagnosis of bovine viral diarrhea infection in cattle. Vet Microbiol 1997; 57(2-3):119-133. Beaudeau F, Belloc C, Seegers H, et al. Evaluation of a blocking ELISA for the detection of bovine viral diarrhea virus (BVDV) antibodies in serum and milk. Vet Microbiol 2001; 80(4):329-337. Greiser-Wilke I, Grummer B, Moennig V. Bovine viral diarrhoea eradication and control programmes in Europe. Biologicals 2003; 31(2):113-118. Moennig V, Houe H, Lindberg A. BVD control in Europe: Current status and perspectives. Anim Health Res Rev 2005; 6(1):63-74. Morshedi A, Mahmudian AR, Dalir Naqadeh B, et al. Serological survey of cattle infected with BVD virus by indirect ELISA and comparison of the use of milk ELISA and serum ELISA in Urmia. J F Vet Med (Tehran University) 2004; 59:227-231. Haji K, Seyfiabad SM. Serological study of bovine viral diarrhea virus infection of cattle in Ahvaz. J Vet Res 2007; 62:21-26. Mahmoodi P, Shapouri MRSA, Ghorbanpour M, et al. Molecular Cloning and Expression of Bovine Viral Diarrhea Virus Non-structural Protein 3 in Escherichia coli. J Microbiol 2013; 6(7):e7044. Protocol NEB. Instruction manual. pMAL™ protein fusion and purification system. Available at: http:// www.neb.com. Accessed July 20, 2011. Kapust RB, Waugh DS. Escherichia coli maltose-binding protein is uncommonly effective at promoting the solubility of polypeptides to which it is fused. Protein Sci 1999; 8(8):1668-1674. Sachdev D, Chirgwin JM. Solubility of proteins isolated from inclusion bodies is enhanced by fusion to maltose-binding protein or thioredoxin. Protein Expr Purif 1998; 12(1):122-132. Harlow E, Lane D. Antibodies: A laboratory manual. New York, USA: Cold Spring Harbor Laboratory Press 1988; 139-227. Ausubel FM, Brent R, Kingston R, et al. Short protocols in molecular biology. 2nd ed. New York, USA: John Willey and Sons Inc. 1995; 130-135. Lindberg A. Bovine viral diarrhea virus infections and its control. A review. Vet Q 2003; 25(1):1-16. Sandvik T. Selection and use of laboratory diagnostic assays in BVD control programmes. Prev Vet Med 2005; 72(1-2):3-16. Collett MS, Moennig V, Horzinek MC. Recent advances in pestivirus research. J Gen Virol 1989; 70(2):253-266. Bhatia S, Sood R, Mishra N, et al. Development and evaluation of a MAb based competitive-ELISA using helicase domain of NS3 protein for sero-diagnosis of bovine viral diarrhea in cattle and buffaloes. Res Vet Sci 2008; 85(1):39-45. Mignon B, Waxweiler S, Thiry E, et al. Epidemiological evaluation of a monoclonal ELISA detecting bovine viral diarrhoea pestivirus antigens in field blood samples of persistently infected cattle. J Virol Methods 1992; 40(1):85-93. Entrican G, Dand A, Nettleton P. A double monoclonal antibody ELISA for detecting pestivirus antigen in the blood of viremic cattle and sheep. Vet Microbiol 1995; 43(1):65-74. Sandvik T, Krogsrud J. Evaluation of an antigen-capture ELISA for detection of bovine viral diarrhea virus in cattle blood samples. J Vet Diagn Invest 1995;7(1):65-71. Bedekovic T, Lemo N, Lojkic I, et al. Development of an indirect immunofluorescence assay for diagnosis of bovine viral diarrhoea virus on ear notch tissue samples in cattle infected persistently. J Virol Methods 2011; 178(1-2):59-62. Heinze BC, Song J-Y, Lee C-H, et al. Microfluidic immunosensor for rapid and sensitive detection of bovine viral diarrhea virus. Sens Actuators B Chem 2009; 138(2):491-496. Kameyama K, Sakoda Y, Tamai K, et al. Development of an immunochromatographic test kit for rapid detection of bovine viral diarrhea virus antigen. J Virol Methods 2006; 138(1-2):140-146. Hewicker M, Wöhrmann T, Fernandez A, et al. Immunohistological detection of bovine viral diarrhoea virus antigen in the central nervous system of persistently infected cattle using monoclonal antibodies. Vet Microbiol 1990; 23 (1-4):203-210.